Our data indicates that the results of the 2016 Republican primaries were not accurate. The differences in this race between the expected statistical pattern and the reported results were not large enough to have changed the outcome. But they are still significant and cause for concern. Here are graphs for two individual states. 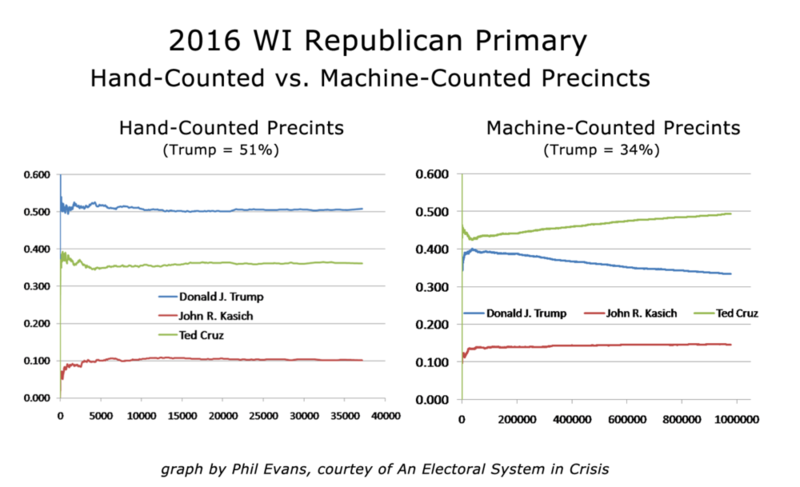 In Wisconsin there is an irregular statistical pattern in precincts that use electronic voting equipment; and also a large difference in candidate percentages between hand-counted and machine-counted precincts. Trump earned as much as 17% more in precincts that counted their ballots by hand. In Ohio the irregular statistical pattern favors Kasich and shows Trump's percentages depressed in the large precincts. More state graphs to come. Please check back or follow me on twitter @luluFriesdat.